Get certified in scuba diving with Aquaventure Dive & Photo! If you’ve always wanted to take scuba diving lessons, experience unparalleled adventure and see the world beneath the waves, Aquaventure Dive & Photo is where to start! Get your scuba diving certification with the PADI Open Water Diver course – the world’s most popular and widely recognized scuba course. Millions of people have learned to scuba dive and gone on to discover the wonders of the aquatic world through this course. At Aquaventure Dive & Photo Center, you have the advantage of training in our on-site heated pool for convenience and comfort! This allows us to offer you free pool time (on Tuesdays) to practice your skills between completion of your Part 1 and your Open Water (Part 2) training dives. We also offer a variety of locations for the Part 2 class. We have a large staff of experience and highly qualified instructors and divemasters who not only love the sport of diving, but love to share their passion with new divers. You can count on them to be patient, thorough, and to put safety first! You will need to bring your student kit, swim suit, a towel, and your personal mask, snorkel, and fins. We supply all the necessary scuba gear needed for the class except your personal mask, snorkel, and fins. There are two reasons we do not supply these items. First, everybody is different and not one mask is right for everyone. The second is for sanitary reasons. For information on mask, snorkel, and fins sets click here to view a few options or stop in to speak to one of our staff. At Aquaventure we have a huge selection of mask, snorkel, and fins sets! We also offer RX masks! Most Complete Dive Center in the Midwest! Unlimited Pool Practice Time (call for details)! FREE Use of Top of the Line Aqualung Scuba Gear for Class! Try various pieces of scuba gear before purchasing! Free Scuba Certification Dives Offered for Customers on our Dive Trips! Largest and Most Experienced Training Staff in the State! Largest and Most Fully Stocked Showroom in the State! Please call shop to register! Private (One on one training) – $435 or $455 for eLearning* Click here to purchase a private class. * Visit Aquaventure Dive & Photo for additional information. Part 1 course fees include materials, classroom and pool training. Part 2 includes four training dives and certification processing fees. Travel with us to any of our winter group travel destinations and we will finish your Part 2 training FOR FREE in warm ocean waters! If you already have travel plans, you can complete part 1 of the course with us, and complete your dives almost anywhere in the world with another scuba instructor, fees vary by location. Cancelation Policy – Course fees are due upon class enrollment to guarantee your space in the class. Class fees are non-refundable within 14 days of the class start date and are non-transferable within 7 days of class start time. One transfer is allowed for a fee of $90. All course fees are forfeited if you do not attend. Aquaventure provides most of the scuba gear you need, but students must have their own mask, snorkel and fins. Our retail specialist can help you choose these items according to your personal fit and budget. Buy a qualifying set of scuba gear (BCD, regulator, alt air source, computer, bag) before or during your Open Water Part 1 class and receive your Part 1 for FREE (up to a $249 value). 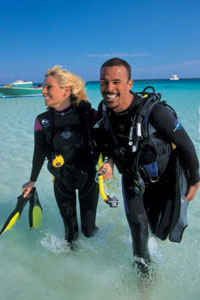 The PADI specialty courses or the Advanced Open Water Diver certification course. To complete your Open Water certification (check out) dives, you must have completed Part 1. Aquaventure Dive & Photo instructors will not allow you into the water until the proper documents have been completed and signed. PADI Youth Diving Responsibility and Risks Acknowledgment (PDF) for children under the age of 12.